This article was originally published in The Next Web. How Neural Machine Translation (NMT) is Creating a Global Post-Language Economy. Businesses are same all over the world. People work hard to make their products sell, their companies grow and broaden their futures. But while business may be universally understood, the languages we conduct it in are not. One of the exciting recent developments in technology by Google has the potential to change the face of business as we know it. It is known as Neural Machine Translation (NMT), and it promises to break down language barriers to a degree we have never seen before. How is it different from Rule-based and Phrase-based translation models? Neural Machine Translation is the shift from rule-based and phrase-based translation models, which translates word-by-word or in groups of words between languages. Instead, NMT translates entire sentences at a time, looking to discern cultural, colloquial, and technical contexts to create more accurate translations. The technology mirrors human intuition in its ability to pick up on subtleties, but because it is a machine, it can process these faster than we can. Let’s take an example of an official note that says: パリに出張の時に私はCEOに会いました. In Japanese, main verbs are always used at the end, so to make sense of the used phrases within it, you need to reference the end of a sentence. NMT is also an end-to-end learning system, which means that it gets better the longer it is in use. This deep learning function powers its neural network, which computes translations with such a degree of complexity that often times even its developers are unsure how it arrived at its conclusion. It is, in a sense, very much like the human mind. The beauty in all this is the ease to conduct international business now. Caring for clients, clarifying concerns with business partners, or trying to reach new markets is possible with the click of a button. All those written communications that would once have required a linguist can be translated with a comparable degree of accuracy using NMT, making business as usual, unusually uncomplicated. So how should we anticipate seeing the effects of NMT? Firstly, NMT allows small businesses to bring their product to the global market, and with them, their increasingly high standards for innovative, quality products. If a businesswoman in Poland wants to sell to clients in Japan, she can do so without having to spend weeks laboring over miscommunications and misunderstandings in emails written and read in second languages. This will increase the diversity of products and services available, while also speeding the pace of innovation. Large corporations are already benefiting from this technology. Google’s launch of NMT technology operates in eight of the world’s major languages, covering 30 percent of the world’s population. 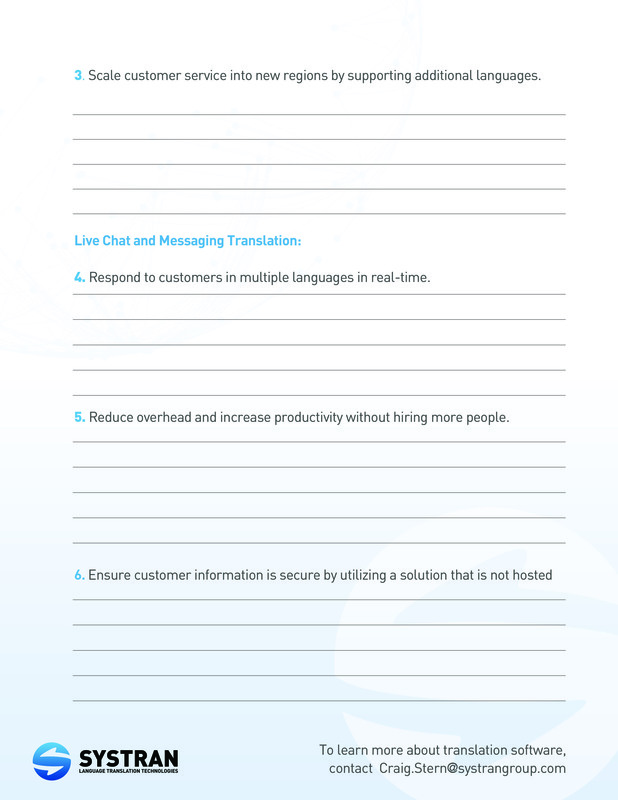 SYSTRAN’s PNMT facilitates communications in 70 different language pairs. An influx of both quality and quantity in products and producers will inevitably boost the current of globalization and its roaring marketplace. Language, which was originally a tool for organizing mankind, has in recent times become a barrier. This new wave of advancements in NMT may be just the crossing over point the global market has been looking for but it is more than ready to bridge that language barrier very soon. SYSTRAN’s team is setting private meetings for an exclusive view of the PNMT concept. For more information, contact Craig Stern at craig.stern@systrangroup.com and to set up a meeting, click here. This article was originally published in inside BIGDATA by Ken Behan. How Neural Machine Translation Will Help Online Marketplaces Turn their Individual Sellers into Global Players. 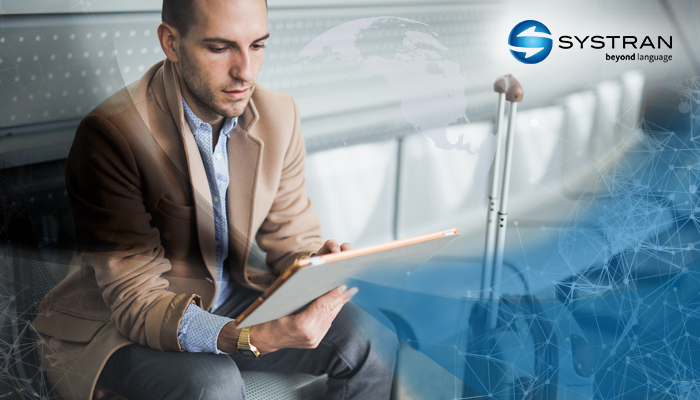 In this special guest feature, Ken Behan, Chief Growth Officer at SYSTRAN, discusses new technology that is aiming to totally eradicate the problem of language as one of the primary factors limiting small businesses from operating abroad. Powered by big data, AI and deep learning, Neural Machine Translation (NMT) advances from previous models that translated words one at a time, to the more human-like method of reading sentences for context and meaning. 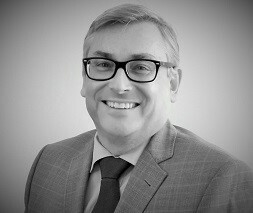 Ken is responsible for defining and implementing the growth strategy for SYSTRAN who have a global presence in the US, Europe and Asia. With 20 years’ experience in the language intelligence industry, he is considered a thought leader in language translation having held several Senior Executive roles within the industry. A native of Ireland he is also a serial entrepreneur as well as business mentor to several Irish Start-ups. “귀걸이가 맘에들어요. 친구들에게 추천하겠습니다.” As an online seller, is this good news or bad? In a survey commissioned by Education First, 49% of executives admitted that language barriers and communication difficulties had prevented significant international business deals from being done. In the same way that language barriers hamper big business, they hamper small business. There are three ways to increase revenue: acquire more customers, increase the average spend per customer, and increase the number of transactions per customer. Here’s the question for eCommerce platforms with millions of creative, ambitious, well-intended people looking to increase their income: can your seller in France close a deal in Japan? Can your seller in China provide customer support to his buyers in Spain? Can your users see reviews in their native language, no matter what the source language was? Historically, these capabilities have been reserved for the captains of industry. eBay has been using their proprietary Machine Translation for years. But machine learning is making it available to everyone. Technology firms have been working on the language problem for decades, but the last several years have seen significant advances that merit the attention of business leaders who are eyeing international markets. The technology is called Neural Machine Translation (NMT), a deep learning system that captures meaning in the context of translated sentences, not the single word. The net result is fluency, where previously, only a “gist” was possible. By combining NMT with existing big data tools that scrape, structure and analyze, new value propositions have suddenly become more attainable. When translated with NMT the result is “How long will it take to get earrings from America to Korea?” where as a statistical engine will return “In the United States, how long will it take to deliver the Korean earrings,” making commerce far more difficult to transact and probably several emails to clarify. Similarly, reviews on web sites are extremely important with 88% of people saying that they now incorporate reviews as part of their buying process. In an “English only” world this tends not to be a challenge but, as HBR reported, 72.4% of people said they would be more likely to buy a product with information in their own language. NMT makes this possible today and with annual E-commerce revenue growth in double digits, e-tailers have a tremendous opportunity to accelerate revenue growth with minimal investment. Customer self-service has also exploded over the last few years with many companies relying on “super users” to solve their clients’ problems. Again those outside the top 4 global languages find themselves in the dark most of the time. 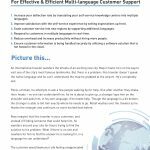 By implementing NMT solutions, companies are not only benefiting from happier customers in languages they struggled with, but also fend off local “copycat” technologies. Of the three revenue growth options mentioned at the top of this piece, increasing spend per transaction and increasing number of transactions per customer are the easiest of the three. At the opposite end, losing a customer is a heavier cost then all. We live in a world where if two tech companies are created equal – the user will buy from the one with the better experience or the more relatable values. Offering cross-language chat, multilanguage reviews and knowledge based would put you in the upper echelon of competitors. This article written by Ken Behan was originally published in inside BIGDATA. How Neural Machine Translation Will Help Online Marketplaces Turn their Individual Sellers into Global Players. Round-trip translation (RTT), also known as back-and-forth translation, recursive translation and bi-directional translation, is the process of translating a word, phrase or text into another language (forward translation), then translating the result back into the original language (back translation), using machine translation (MT) software. It is often used by laypeople to evaluate a machine translation system, or to test whether a text is suitable for MT when they are unfamiliar with the target language. Because the resulting text can often differ substantially from the original, RTT can also be a source of entertainment*. In 1968, during the height of the Cold War, our nation’s intelligence organizations and military were working to decipher and understand Russian communication threads coming through their offices. Answering the call, SYSTRAN was born. We provided the vital translation software that our nation’s security forces required in order to do their job effectively. Back then, we were providing our services through the IBM mainframe. Thankfully technology got smaller and more advanced, allowing SYSTRAN to move into several different areas. With the advent of the PC, we developed a product that people can use on the desktop, translating text into 130+ language combinations, enabling real-time multilingual communication across the globe. Then recently, just in the last decade, we experienced further advancements through the smartphone. Speech recognition software along with the smartphone provided a plethora of breakthroughs. 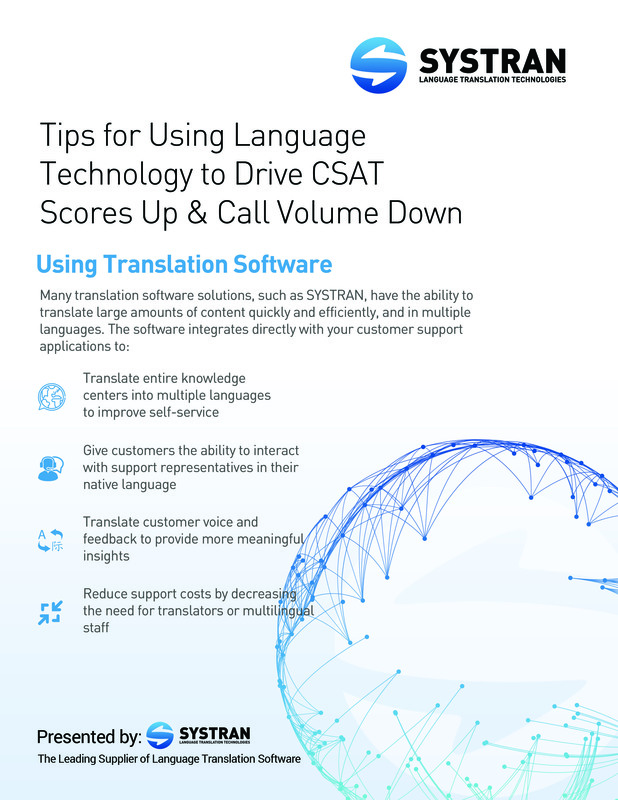 For example, SYSTRAN developed S-Translator, the official translation solution on the Samsung Galaxy S and Note series. Now if you’re in a taxi in Korea you can use your phone to tell someone where to go without speaking a word of the native language. As kids we were always intrigued by the way Google Translator worked. While it translated those famous French quotes for us, there were limitations which even Google couldn’t surpass. Since then, language has been a barrier— hindering our global crusades. Be it a worldwide competition or business meetups across countries, a common language would have been the best idea which sadly is pretty hard thing to materialize. Even readers at the Huffingtonpost must have had difficulties with other country specific domains, offering great pieces of work which couldn’t be accessed— owing the language barrier. 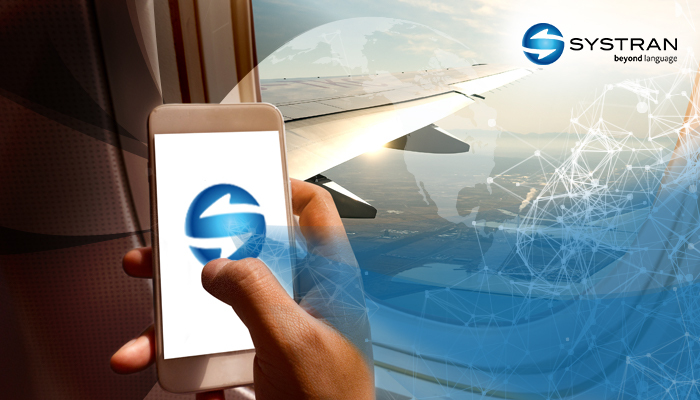 Here we interview Ken Behan, Vice President, SYSTRAN Software Inc. and understand what sort of challenges we face when it comes to a multilingual platform like the Internet. We will be asking him about the process involved with translations and analysis apart from the levels of accuracy. Lastly, he will be talking about the company and what purposes it can serve, towards the common good of this society. 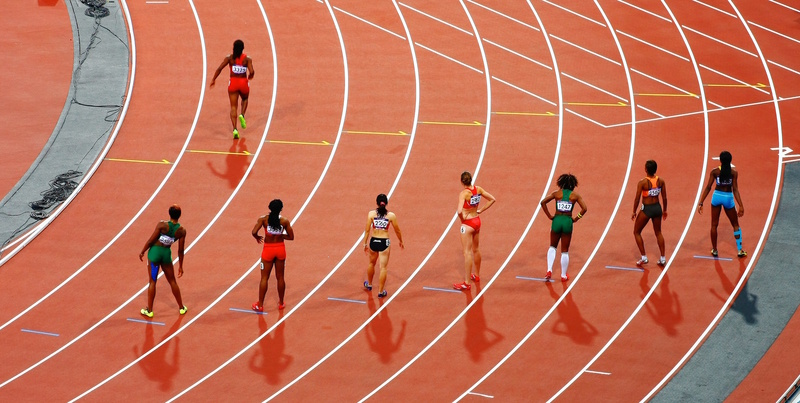 This summer, the social media sphere will be buzzing again with fans and athletes posting about the 2016 Summer Olympics in Rio de Janeiro, Brazil. It will be the first Olympic games to take place in South America. You can also expect networks, publishers, and brands to get in on the social media experience by generating more content than ever before. – On Twitter, there were 960K mentions for Bolt, 830K for Phelps, and 490K for Tom Daley (British diver who took the bronze) during the games. – The first day of Olympics, there were 3 million tweets in total. The numbers go on and on, especially when you take into account all the views, likes, tweets by sports teams, athletes, and brands. There are plenty of useful stats out there from archives of the first ever “Social Games” as most tech blogs described it.